There are many factors that determine height. There are many things that influence how much you grow. The environment you live in, the food you eat, and your genes all play a part in how much you will grow during your youth. The average height of an American woman is between 163 cm and 164 cm or 64.2 to 64.6 inches. Girls usually stop growing in height when puberty has finished. This is the time when the hormones, nutrients and genes have reached their peak in regard to being used for growth. After a girl's first period it is usually between one to three years when she will stop growing and the amount of growth after that first period averages at about one to two inches per year. The genes that you have been born with, the genes that you inherited from your biological parents have a large determining factor in how tall you are likely to be. Medical conditions such as growth hormone deficiency, kidney problems, hypothyroidism or inflammatory bowel disease can all affect growth. A genetic predisposition to a short or tall stature will affect the height that a child will grow to. This is called familial short stature and is nothing to worry about. 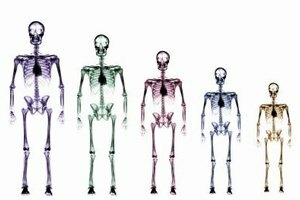 A person's bone age can be different from their chronological age. If you are worried about your child's height, a test can be performed to determine bone age. This is done by taking an x-ray of the left wrist and hand. If the test determines that a child's bone age is much less than a child's chronological age, it is highly likely that the child will continue to grow beyond the age it is expected. Girls continue to grow until a bone age of 14 years old. Good nutrition is essential if a girl is going to reach her optimum height. A healthy balanced diet, rich in vitamins and minerals and low in sugar, salt and saturated fats, will ensure that a girl will reach her genetically determined potential height. A healthy diet will also ensure that she is not over- or underweight and that she maintains a healthy balance of weight and height. Exercise is also important as it will keep bones and joints healthy and strong; this is essential for good growth. FWHC: Health Questions and Answers: Do I Stop Growing With My First Period? What Does Big Kids Mean in Shoe Sizing? Can Vitamins Stop Hair Breaking?